It's time for our May Die Cut Design Team Designer challenge. 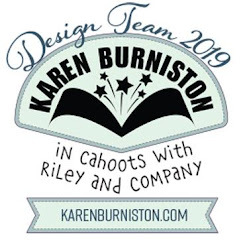 Check out the Elizabeth Craft Designs blog today to see what our talented designed created for the challenge. Being Negative - Normally when we die cut we get a positive piece (the actual die cut) and a negative piece (the piece left over from when we cut the die and that we throw away). In many cases those negative pieces can also make interesting cards, so let's use the negative portion of the die cut when creating your card. If you wish you can also incorporate the positive piece of the die cut. For my card today I decided to combine Negative Die Cutting with the Split Negative technique. Using this technique I was able to create two cards at the one time. For today's challenge Elizabeth Craft Designs are giving away a Background Die Prize pack which includes: heart background; circles background; chevron background and diamond background to 3 winners. 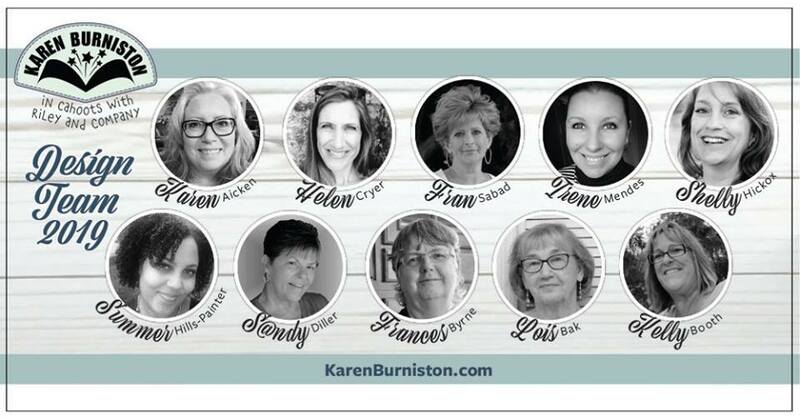 The winners will be announced on Friday, May 5 on the Elizabeth Craft Designs blog. I have used the Split Negative Technique using stamps before, but I haven't done it using dies. So after a few missteps along the way, I finally figured out what I needed to do to get the look I was after. Using the largest die from the Stitched Hearts die set die cut 3 heart shapes from White Soft Finish Cardstock. 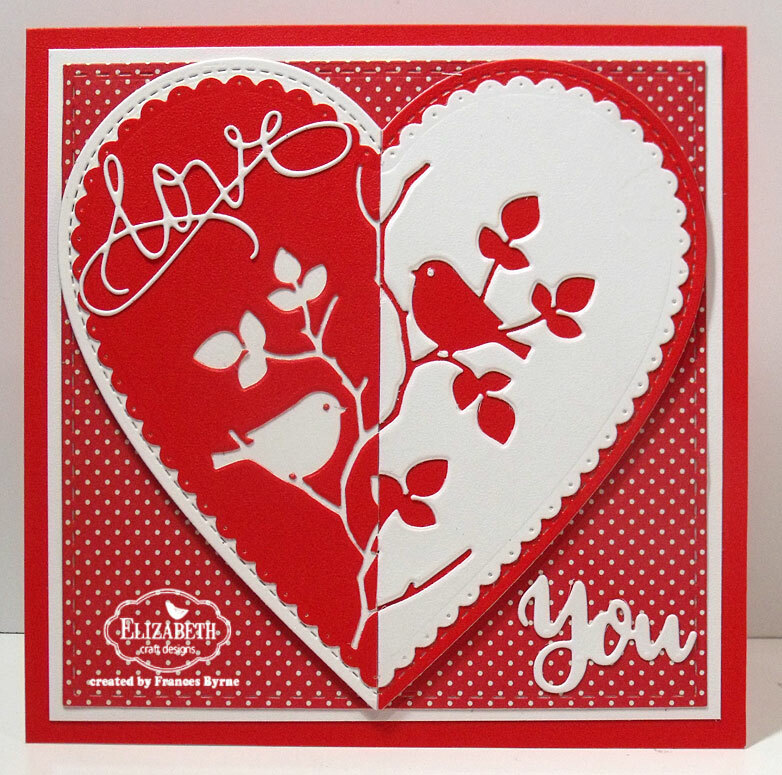 Using the largest die from the Stitched Hearts die set die cut 1 heart shapes from Ladybug Red Soft Finish Cardstock. Using the largest die from the Scalloped Hearts die set die cut 1 heart from White Soft Finish Cardstock that has Clear Double Sided Adhesive Tape on the back. 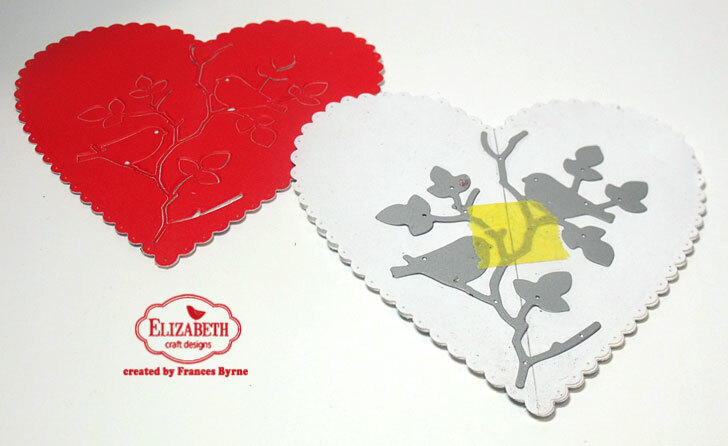 Die cut an additional large Scalloped Heart from photocopy paper, draw a line down the centre of the heart. Position the Lovebirds die so that is is centred on the heart and that a bird is on either side of the centre line. Secure to the paper heart using some form of temporary tape. 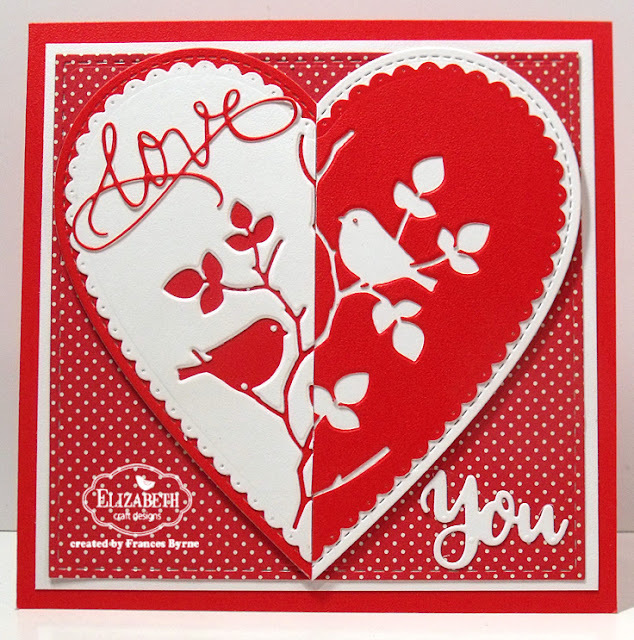 Place the paper heart over one of the scallop hearts die cut in step 1, taping paper heart so it doesn't move. Run piece through die cutting machine. Carefully remove the paper heart from the first scallop heart and place it over the second scallop heart and repeat the die cutting. Remove the release sheet from the scallop hearts and attach them to the stitched hearts of the opposite color. 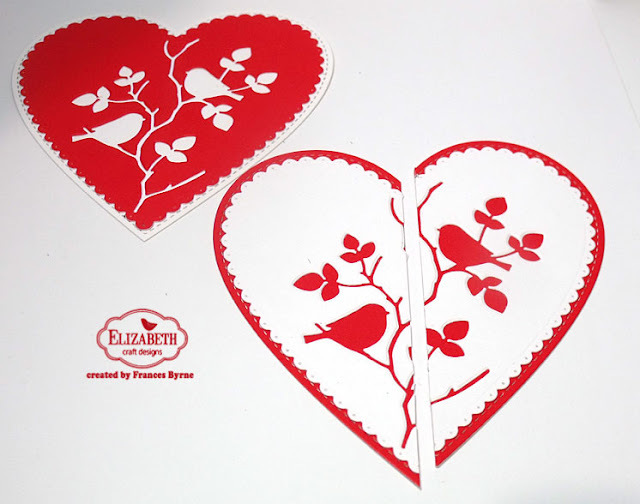 Use a paper trimmer to cut down the middle of each heart as per photo above. Adhere one half of the die cut piece to the remaining stitched heart we die cut in step 1. Adhere the opposite color half from the other die cut next to the first heart, so you have your "Split Negative" piece. Don't forget to add the eyes and small piece from the branch to the negative die cut image. Die cut the largest square from the Stitched Squares die from polka dot designer paper. 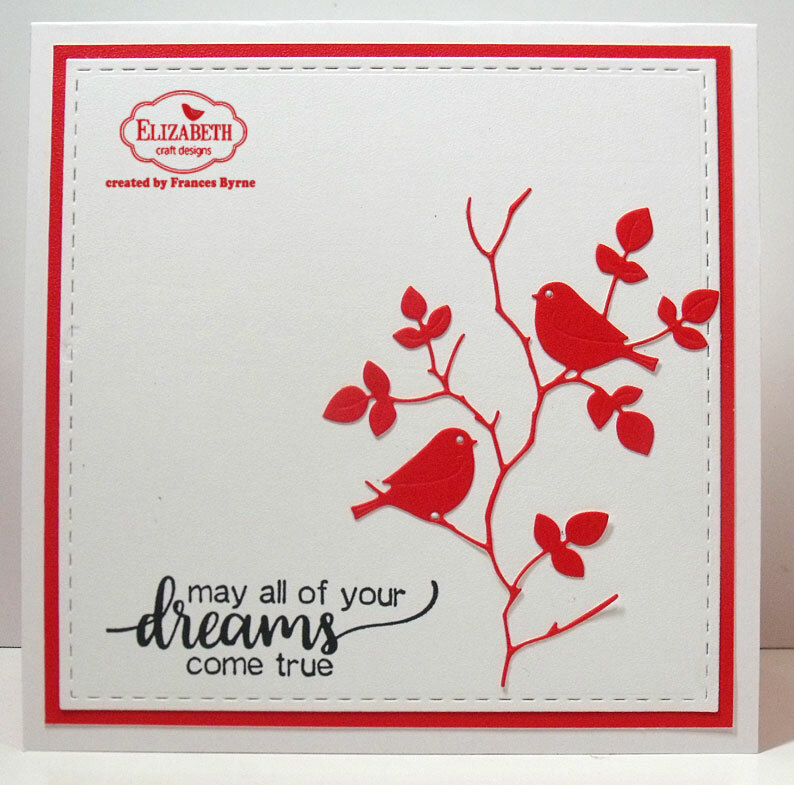 Layer this piece to a piece of White Soft Finish Cardstock that measures 5 1/2 inches square. Cut a piece of Ladybug Red Soft Finish Cardstock that measures 5 3/4 inches x 11 1/2 inches. Score along the long side at 5 3/4 inches and fold to create a 5 3/4 inch square top folding card. Adhere the layers to card base. Adhere the Split Negative/Negative Die Cut Heart to the centre of the front of the card. Using the Away with Words - Baby Love die set, die cut the "love" sentiment from both White and Ladybug Red Soft Finish Cardstock that has Clear Double Sided Adhesive Tape on the back. Adhere the white "love" sentiment on the top left hand corner of the heart that has the red half heart on the left side. Adhere the red "love" sentiment on the top left hand corner of the heart that has the white half heart on the left side. 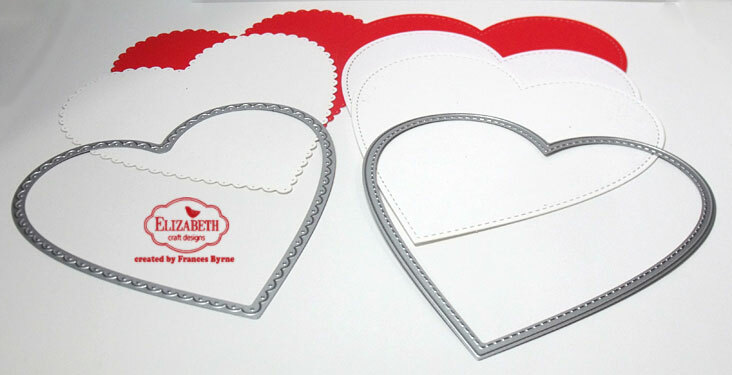 Using the Love Sentiments die set, die cut the "you" sentiment from White Soft Finish Cardstock that has Clear Double Sided Adhesive Tape on the back. Adhere the sentiment to lower right hand corner of card. Die cut the largest square from the Stitched Squares die from White Soft Finish Cardstock. Layer this piece to a piece of Ladybug Red Soft Finish Cardstock that measures 5 1/2 inches square. Adhere the layers to the inside of card. Using a sentiment from the Dreams Sentiments Clear Stamp set, stamp to the lower left hand side of the card in black ink. That's it from me today, I hope you enjoyed my card and tutorial. 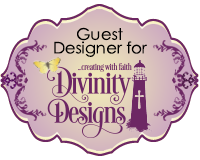 Don't forget to check out the Elizabeth Craft Designs blog to see all the wonderful creations by our talented designers and for a change to win the giveaway. Thanks for reminding me of the split negative technique, your card is lovely. Wonderful cards! I love this technique. I would not have tried it with this die because it is so intricate, but you made it work beautifully. Thank you for sharing the details. Wow - that is so cool! Great job on the technique. All these are wonderful and impressive cards! 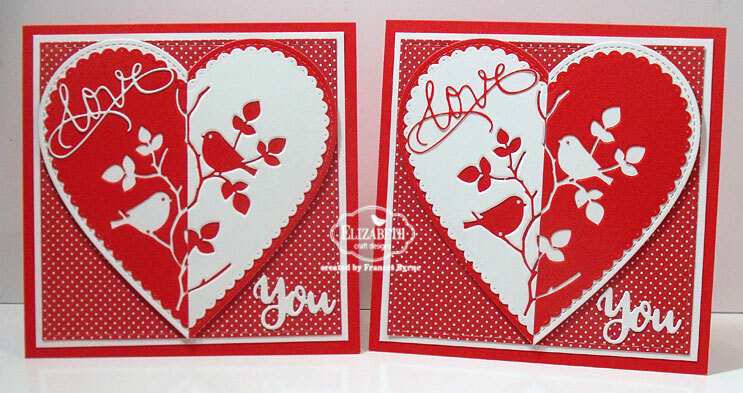 The die cut cards are a great way to express your love and affection to your beloved. Thanks for telling the steps of creating these pieces.